Motility is an inherent property of living organisms, both unicellular and multicellular. One of the principal mechanisms of cell motility is the use of peculiar biological engines – flagella and cilia. These types of movers already appear in prokaryotic cells. However, despite the similar function, bacteria flagellum and eukaryote flagella have fundamentally different structures. Chapter One of this book is devoted to a comparative analysis of the flagella of prokaryotes and eukaryotes. It’s believed that flagellum in eukaryotic cells appeared for the first time in ancient flagellates. In Chapter Two, the results of the authors’ long-term studies of flagellum dinoflagellates are discussed. The “evolutionary invention” of the ancient flagellates proved to be so successful that the axonemal structure in flagellum has not changed for hundreds of millions of years. In the third chapter, Drs. V. Bondarenko, G. Prokopchuk and J. Cosson reported the analyses of kinetic characteristics of flagella motions in fish using the most modern methodologies. In Chapter Four, the spermiogenesis of the parasitic wasps Cotesia congregata are discussed. Their data showed that significant shortening of the flagella occurs during the formation of the mature spermatozoon and this flagella has been the shortest spermatozoon flagella described in the animal kingdom until now. Centriole in this spermatozoon is transformed into a special structure known as the “cogwheel structure” that does not contain microtubules. Chapter Five discusses which of the centrioles – mother or daughter – creates the moving cilium and sensitive cilium. 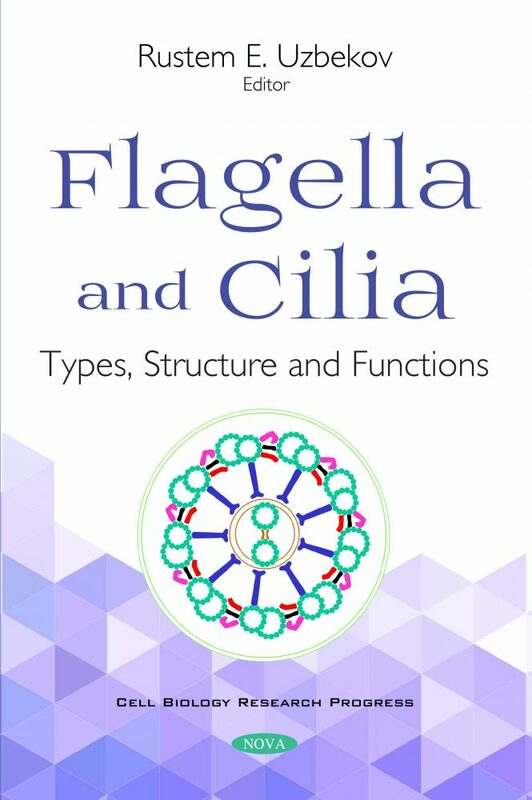 In Chapter Six, the biochemical aspects of primary cilium assembly pathways, intraflagellar transport and ectosome release are described in detail. This chapter provides an overview of the trafficking pathways involved in ciliary compartmentalization and describes the primary ciliary as a sensitive “cell’s antenna”, participating in many regulatory processes in the cell. Defects in flagella and cilia cause many hereditary diseases. Different examples of ciliopathy are described in Chapter Seven. Chapter 5. A Question of Flagella Origin for Spermatids: Mother or Daughter Centriole? Keywords: Cilia, flagella, bacterial cilia, centrosome, centriole, axoneme, cell movement, spermatozoa, centriolar adjunct, primary cilia, cellular sensitivity, microtubules, basal body. The book is written for senior students of biological and medical specialties, researchers working on problems of cellular mobility and sensitivity.